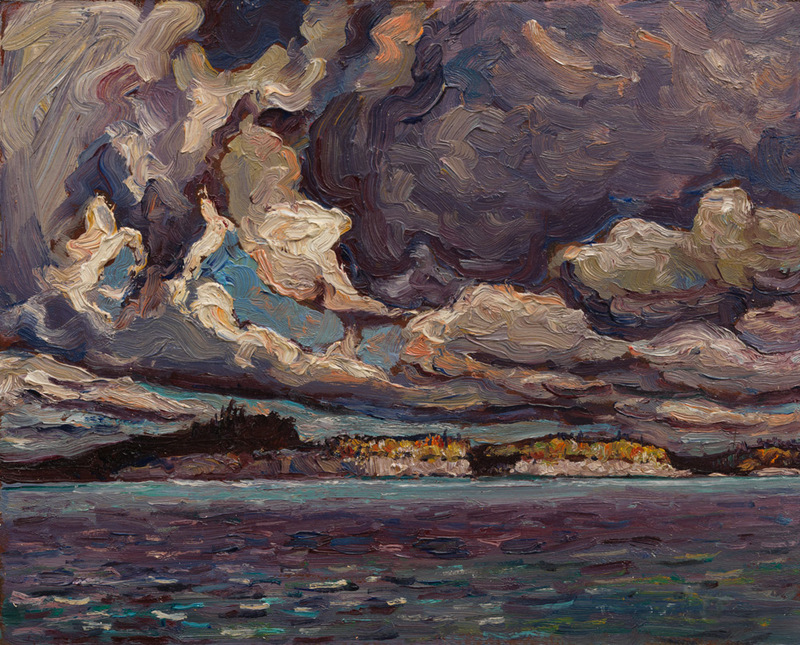 The artwork of the Group Of Seven, like the Sketch Of The Lovely North as seen above, is looked at and tracked over a trip through a group of people in Painted Land. Seeing the documentary Painted Land reminded me just how much we Canadians lack the knowledge of our artistic history. The film is more than a documentary of art. It’s also a documentary of three adventurers retracing the trips taken by the seven Canadian artists known as the Group of Seven. For those who don’t know, the Group Of Seven were a group of seven Canadian artists from Ontario whom in the 20’s and 30’s visited landscapes of Ontario and painted images of what they saw in their own way. Many can say they were the first artists to define Canadian art. The Seven still rank among Canada’s most renowned artists. In this documentary are three adventurers: author Joanie McGuffin, photographer Gary McGuffin and art historian Michael Burtch. They go on a journey along the various trails, coastlines and waterlines to retrace the route taken by the Seven and even see for themselves the natural places of Canada depicted in their paintings. The trip would involve many years of research, canoeing, portaging, mountain climbing and bushwhacking to retrace their steps and learn of their inspiration. At times, they’d even bring people along like the McGuffin’s daughter or other teens interested in art. The Group Of Seven artists were the first artists to define Canada artistically although their art was not completely accepted at the time. We even learn about the negative reception they received as their art premiered. Some people were unhappy with what they saw. Oddly some thought Canada was not ready to have what defined Canadian Art. Keep in mind Canada was just slightly over 50 years old at the time. The most fascinating comment I heard from one art pundit was she hated the paintings so much, she was afraid if she looked any longer, she might love them! Odd. I found this documentary very valuable. I feel this is a great lesson for anyone who’s into art, Canadian or not. I especially feel that Canadian artists should see this as this will give them a good sense of their artistic history, even if the painting style of the Group Of Seven is not their style at all. I feel we as Canadians lack the knowledge of our renowned artists. I myself only learned of the Group Of Seven just as I was watching this documentary. Here in B.C., we’re mostly familiar with Emily Carr, who is one of Canada’s best artists in her own right. Nevertheless I found learning of the Group Of Seven very valuable and informative. I give the documentary big kudos for that. For the most part, I feel this is not really a big screen documentary. Even seeing TVO, which is for the educational channel TV Ontario, at the end credits makes it obvious this is a documentary meant for television airing. I think if it were to be aired on the big screen, it would have to be in an art gallery that has a theatre screen or a performance stage, like the Winnipeg Art Gallery. It’s possible to show it on an art gallery theatre screen whether or not there’s a Group Of Seven exhibit. Painted Land: In Search Of The Group Of Seven may be more of a television documentary than a big screen documentary. Nevertheless it’s a good educational documentary for both art and history.